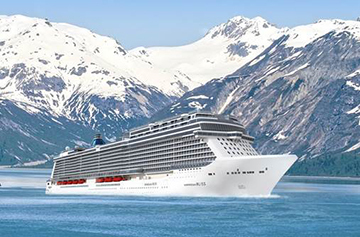 Norwegian Cruise Line has just announced that its next new build will be the ultimate ship for Alaska cruises. Norwegian Bliss will homeport in Seattle and set sail on her maiden season in summer 2018. Custom built with features for the ultimate Alaska cruise, the new ship will be the first of its kind to visit Alaska. Norwegian Bliss will be the third cruise ship to join Norwegian Cruise Line’s Breakaway-Plus Class, alongside Norwegian Escape and Norwegian Joy, and will have special features and amenities to compliment the Alaska cruising experience. In true Norwegian Cruise Line style, the hull of the new addition will feature a new design by commissioned marine life artist Wyland. Passionate about marine conservation, Wyland is known for his whale murals, art galleries and major non-profit community service contributions. Guests sailing on Norwegian Bliss will be able to enjoy seven day Alaska cruises calling at Ketchikan, Juneau, Skagway and more alongside scenic glacier cruising. Life onboard will feature entertainment, activities and signature dining experiences from Norwegian Cruise Line. The new ship will be constructed at the Meyer Werft Shipyard in Papenburg, Germany, scheduled for delivery in 2018. Request a copy of our newest Alaska brochure or browse our Norwegian Cruise Line sailings.